Not to be confused with Arrythmia. Erythema (from the Greek erythros, meaning red) is redness of the skin or mucous membranes, caused by hyperemia (increased blood flow) in superficial capillaries. It occurs with any skin injury, infection, or inflammation. Examples of erythema not associated with pathology include nervous blushes. 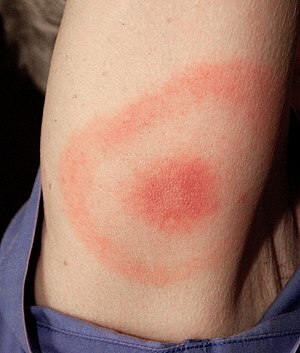 It can be caused by infection, massage, electrical treatment, acne medication, allergies, exercise, solar radiation (sunburn), photosensitization, cutaneous radiation syndrome, mercury toxicity, blister agents, niacin administration, or waxing and tweezing of the hairs—any of which can cause the capillaries to dilate, resulting in redness. Erythema is a common side effect of radiotherapy treatment due to patient exposure to ionizing radiation. Erythema disappears on finger pressure (blanching), while purpura or bleeding in the skin and pigmentation do not. There is no temperature elevation, unless it is associated with the dilation of arteries in the deeper layer of the skin. ^ Mosby's Medical Dictionary (9th ed.). St. Louis, Missouri: Elsevier. 2013. ISBN 978-0-323-08541-0. ^ Weterle R, Rybakowski J (Mar–Apr 1990). "Test niacynowy w schizofrenii" [The niacin test in schizophrenia]. Psychiatr Pol. 24 (2): 116–20. PMID 2084715. Look up erythema in Wiktionary, the free dictionary. Wikimedia Commons has media related to Erythemas.